Merry Christmas to everybody! As the year quickly approaches it's end I find myself on my way back home to the Dominican Republic today. I've been gone 6 weeks and have been all over the place. I started in San Diego, CA visiting old friends (including a night in Mexicali, Mexico), I then flew to Hawaii for Christian Surfers' International Conference, I had an overnight lay-over in Seattle where I was able to visit old friends from my childhood in Ohio, I was able to visit the lovely Emily Jamison in Philadelphia and her family, and finally flew to Sarasota, Florida with Emily to celebrate Thanksgiving with my family. 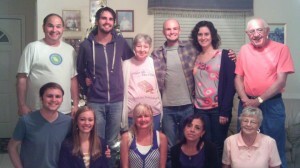 It was the first time I've been with my family in Florida since May of 2011. To be honest, I am ready to be home! Christmas in the Dominican Republic is one of my favorite Holidays. This will be my fourth Christmas in the DR and I'm just as excited about it as if it were my first. Although Christmas morning is not a big deal in this culture, the meal on the 24th consists of a huge gathering of family around a dinner table for the feast of the year. Many families save their money for the whole couple months leading up to it in order to cook this fantastic meal. While this big meal on the 24th is foreign to many Americans, the hospitality and love shown to individuals less-fortunate or without a family is not. I usually receive my first invitation for this meal around early October. Since the meal is so epic I try and commit myself to one home and make small visits to other close friends afterward. The love and hospitality despite humble accommodations has really forced me to love this country and it's people. There is no doubt in my mind that God has made me to serve here. I'll be posting a photo blog later in the month re-capping 2012.